Allow me to explain how a talk on the future of the International Monetary System (IMS) left me with the insight that the IMS is to local crises like the climate is to weather. I had made the trip to London especially for the talk by Vítor Constâncio, Vice-President of the European Central Bank. His talk “The Future of the International Monetary System” was part of the OMFIF Golden Series on World Money. The venue was the gem that is the Armourers' Hall, residence of The Worshipful Company of Armourers and Brasiers since 1346. The talk was set against the backdrop of a third governmental change in Europe, this time in Spain, as part of the Eurozone crisis contagion. News programs were still ringing with the automatic triggering of historic drastic financial cuts in US public spending. UK politics and public opinion were trending towards the more insular. Just a mile away, the tent city (well hamlet actually) of Occupy London was still firmly ensconced outside St Pauls and major industrial action by UK public sector unions was planned for the 30th November. In these “interesting” financial times, how could I resist attending an event on the future of the IMS! Initially, Vítor Constâncio's talk gave me an insight into the roles of the International Monetary System (IMS), the International Monetary Fund (IMF) and international currencies. As Vítor Constâncio explained, the origin and basis of the IMS was to establish an orderly system of payment that works with internal currencies, exchange, adjustment and liquidity. Liquidity and adjustment would enable external stability, with exchange rates and capital flow as core functions. The system is not perfect - in good times, trade imbalances can arise and there used to be little incentive for market discipline. 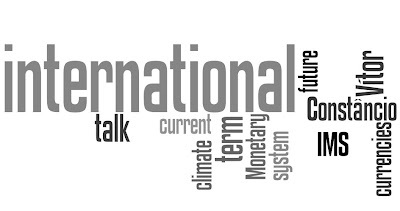 The future of the international monetary system fosters international currencies. The reality is that no single currency can support international finance. To date, the US dollar has been the dominant international currency. However, the Euro is now the second most important currency, though it is more regional. It has held up remarkably well despite the Eurozone crisis. The belief is that when stability returns, it has potential for more influence in the future. The Chinese Renminbi (RMB) is a new contender. Liberalisation and internationalisation will assist its growth into an international currency. So how can the IMF contribute towards the IMS goal during the current economic fluctuations? IMF resources have been trebled since 2008, though Vítor Constâncio felt more financing is required to get countries to lower reserves (to stimulate the economy?). The multilateral surveillance of the impact of IMF and International Committee actions needed to be strengthened and more research conducted into the impact of any measures. Are IMF changes over the next 10 to 15 years sufficient? Vítor Constâncio thought so, though he expected a bumpy ride to a multi-polar international monetary system. Requirements are domestic growth & demand and the EU learning the lessons from the current crisis. The IMS to crisis is as climate to weather? Absorbing the tenets of the talk (however inaccurately), listening to the question and answer session and a brief talk with Vítor Constâncio immediately afterwards did give rise to two overall impressions. There is the long term – and there is the short term. The discussions and opinions expressed as part of the event largely represented the longer term. They looked towards continued gradual internationalisation and stability in finance, involving nation states, regional groupings and international currencies. The time-scales are in decades, the impact is global. The fluctuations are evened out – like the gradual change in climate. The current environment of savage national economic readjustments is the short term. The dramatic political and social reactions, the “adjustments” and counter-reaction are occurring explosively within days, months or a year. The rapid fluctuations are similar to our experiences of apparently capricious weather events. So, in my mind, the long term perspective of the International Monetary System is to the very current crises as the climate is to weather. As I return to the current reality of survival in an immediate unpredictable environment, can I be reassured by the promise of long term positive change? Or should I be worried about a potential increasing irrelevance of national democracy, subservient to international finance, spikily summarised in the joke “Banker are no longer bankers, they are potential prime ministers!”. Alternatively, will there be cataclysmic social upheaval from an angry populace, bearing the brunt of adjustments, who make the same link as the tent city placard “If criminals can't print money, why can banks?” and negate any chance of change. I am more of an optimist. Like Vítor Constâncio, I believe that long term, things should improve, it will just be a bumpy ride.